Our new project, simple multi 1-4-players racer with comic gfx. Im useing Pyxel Edit to develop this game gfx. We wanted to make game similar to Rad racer but with multiplayer option. 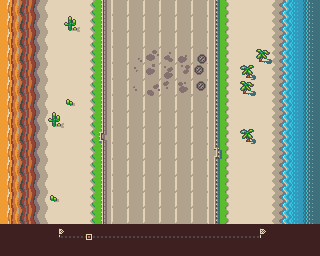 Game could be cuted into levels that could have start and end, some other obstacles and unique background scenery (hills, ocean, desert, bridge, etc). Right now, game is playable for one or more players or CPU oponents. Road is random generated, it rolls faster and faster, slows down after every car hit. You can move other street cars to make Your oponents life harder Code - Earok, gfx - Koyot1222, msx - JMD Mostly is an christmas present for all amiga owners, hope they enjoyed it. i like it! awesome work man! maybe add an engine flare for the speed boost part?